This week, Instagram has rolled out an upgrade and caught many users by surprise. Especially those familiar with Snapchat. 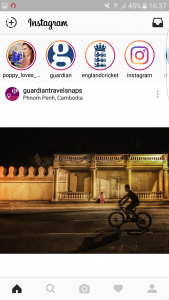 Instagram stories appear at the top of Feed – profile pictures with coloured circles show which users have a current story to view. Instagram stories is the name for the new feature designed to encourage more sharing. You can take still shots or moving images – with sound – which are shown together in a slideshow format. Each image or video can be filtered, splashed with icons or captioned, using Instagram’s simple tools. When you post images to your story, your profile picture is circled with a coloured ring. When other users click your profile, it will open up your current story. Your profile picture will also appear on the top of the feed, so your users will see it – as well as other stories from people they follow – at the top of their feed. With stories, Instagram has also added a bonus feature: you can see how many people have viewed your story, as we well as who they are. You cannot, however, prevent your details being listed on other people’s stories when you have viewed them. You get to see other people’s stories on a bar at the top of your feed. This shows a list, in order, of the stories from the people and accounts you follow. Click on a circle and you will open up that person’s story. Swipe left or right and you will see the next person’s or previous person’s story. If you want to comment to a user in response to a story, you can send an Instagram Direct message in by clicking an icon on screen. But likes and public comments are not supported – yet – with stories. Stories disappear after 24 hours – confirming Instagram’s intention to make stories a compelling, engaging and sticky feature. Your story is displayed as publicly as your regular Instagram posts – that is, if you have your account set to private, your story is visible only to your followers. However, you can set each story to be hidden from users you don’t want to see it, even if they follow you. With this significant upgrade, Instagram has pitched itself in direct competition to Snapchat. And, while there are no advertisements on the stories service yet, the features, immediacy and analytics are all in place to make Instagram stories a major advertising opportunity should Instagram choose to enable it. Watch this story.